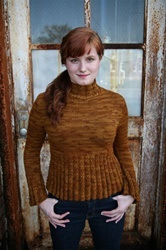 This ribbed pullover has a subtle twist--spiral ribs! An a-line shape and flared sleeve give a flattering silhouette. Suitable for smooth worsted weight yarns with memory. 6 sizes from a finished 34" through 44 1/4". This sweater is meant to be close fitting, so allow 1" wearing ease. Knit in the round on circular needles. Gauge is 17st = 4 inches in stockinette stitch on size 9 (6mm) needles.